It's back, it's back! The Refashioners is back for 2015 with exciting shirt refashions hosted by the Makery every single day in August. I had so much fun taking part two years ago that it was impossible to turn down Portia's second invitation. 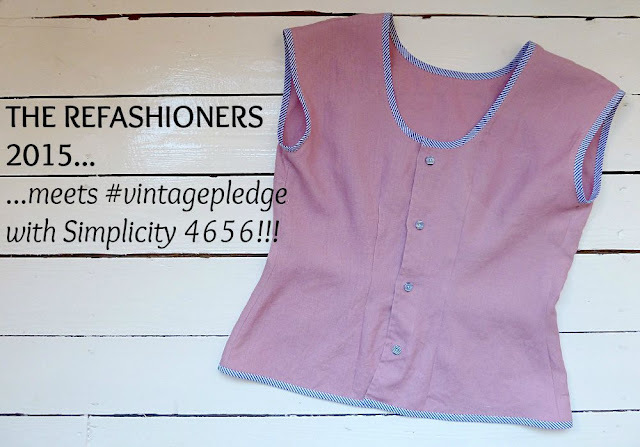 I was super adventurous last time, despite refashioning not being a strong skill of mine, but this year I took a slightly different approach which involved ticking off another #vintagepledge make off my list. There's still plenty of time to sign up by the way, with some great prizes up for grabs! I picked my own this year and I was delighted when I happened upon this 100% linen Boden shirt for a mere £4.50. It was in tip top condition and although I'm not usually a huge fan of pink, this shade of blush really appealed to me. 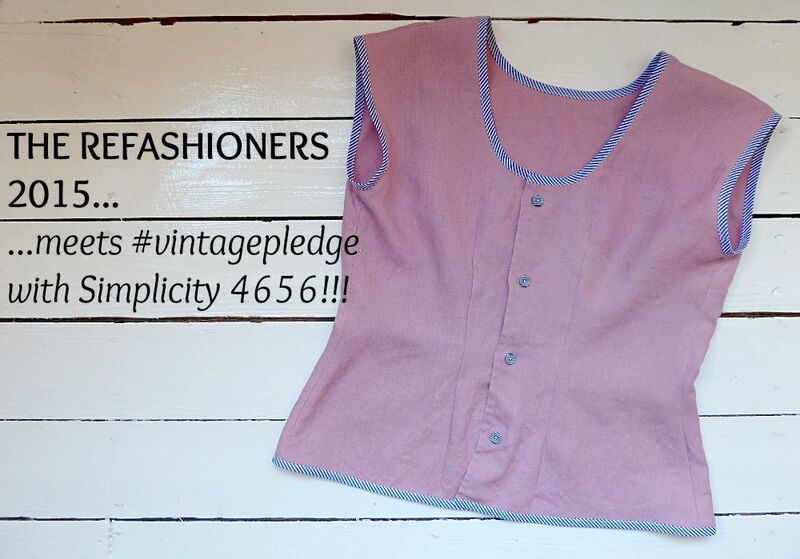 In a bid to end up with a classic wardrobe staple I turned to 1950s Simplicity 4656. To find out exactly how I did this, hop on over to my post on the Makery! 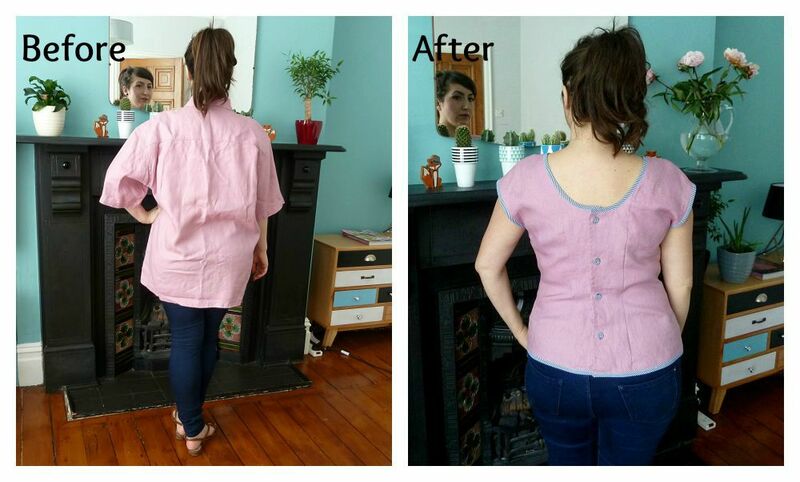 Instead of facings, I finished my neckline, armholes and hem with stripy bias binding for an extra pop of interest. Pink and navy is such a chic combination and the cherry on top of course, were the matching buttons I stumbled upon on ebay. For the first time in its history, you too can take part in The Refashioners with a truly wonderful prize package worth over £500 up for grabs! So, are you tempted to #getshirty with us? This looks great! Lovely pattern. Plus vintage pledge win too! Cute top and the fit is so flattering. I'm a fan of button back tops. 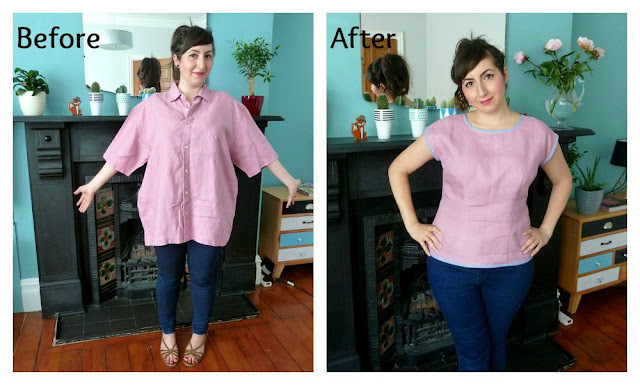 I've made a comment over at Makery but just wanted to say here how much I love this refashion! I really like tops that button up the back and this one is a masterpiece. As for finding those matching stripy buttons - brilliant! Thank you so much for taking the time to pop over here and leave some kind words too...really appreciate it! I love this project! Good call on that striped binding. Great job with this refashioning! It's a really cute refashion - I love the stripey binding and matching buttons! tooooo fab for words! lurve it! You did an amazing job! It's so, so cute! So pretty! And it fits so nicely in the back!